this is Gregory, our 4 month old Lab pup, the new member of my household. Hi. 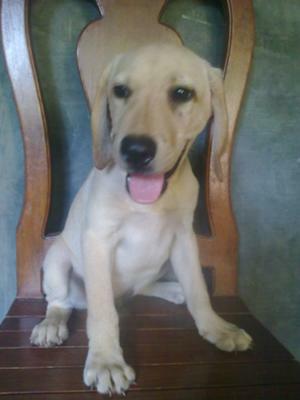 Recently, (December 1, 2011) my husband bought a 4 month old Lab pup from his office mate. At first I was hesitant to have another dog in the house, specially a Labrador, it's odd for me and ewwws... ha ha! But when, my husband told me to go with him to get the pup, I didn't resist... in that cage where this pup housed, there were 4 of them, it is this little handsome caught my attention. Hello Sharon. Thank you for leaving a very sincere comment about my Gregory. Happy Holidays! I love the picture of Gregory and the story you shared in how he won your heart! Enjoy your new family member! "Gregory" is an interesting yellow lab name and one I probably would not have considered. First of all, it caught be by surprise when I saw the picture of your yellow Labrador Retriever and learned he was in the Philippines. When I visited your country a few years ago, I saw LOTS of dogs, but they all looked to be mixed breed dogs. I was visiting Santa Cruz, Laguna, for nearly a month and I don't think I ever saw a pure bred dog (probably just me). Anyway, Gregory is a very cute dog with very big feet. I suppose he will be quite a large dog when he is fully grown. I have a chocolate Lab named Bailey and she is almost 13 years old. That's pretty old for a Lab, but she is still doing well (although she does pass a lot of gas!). Labs of any color are great for families and I wish you the very best with Gregory! Join in and write your own page! It's easy to do. How? Simply click here to return to Labrador dog names.